Bob has discovered another Greek Theatre in Siracusa, Sicily, Italy. This one is even still in use. Now that’s staying power. Bob is at the Citadel in Victoria, Gozo, Malta. Malta is fabulous. Check out Bob’s family’s day in Valetta. Where in the world is Bob Hubert now? Where in the world is travelling rubber chicken, Bob Hubert? Bob is in Koprivshtitsa. This small, picturesque village is the birthplace of the Bulgarian Revolution in 1876. 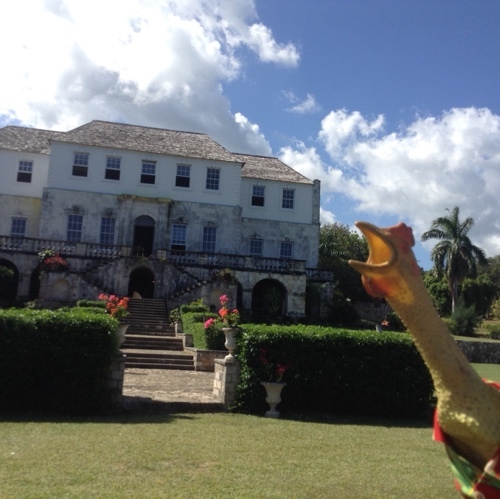 Where in the world is traveling rubber chicken, Bob Hubert now? He is at Gullfoss, which is a multi-tiered waterfall in the Hvitá River in Southwest Iceland. Bob and the White Witch...Where in the world is Bob Hubert? Bob Hubert, Travelling Rubber Chicken extraordinaire is on the move. Can you guess from the picture, " Where in the world is Bob Hubert?" Hint, the scroll below the picture for the answer.